In the letter to the Jewish group, Ellison further claimed that his association with the Nation of Islam was limited to an 18-month period in which he was helping to organize the Minnesota contingent at the 1995 Million Man March. The article said Ellison read comments on behalf of the Nation of Islam. The Tribune noted Ellison used his religious name of Muhammad in reading the statement to the board in defense of Jackson. “It appears that MIAR’s first initiative against racism should be directed at itself, or at least the 11 board members who voted to dismiss Joanne Jackson,’” the Tribune said. WND also found an April 5, 1998, article in the Star Tribune describing Ellison as a well-known Nation of Islam supporter. “Ellison, a newcomer to DFL politics, is well-known in the black community as the former head of the Legal Rights Center and a supporter of Louis Farrakhan and the Nation of Islam,” the article said. Ellison’s affinity for the Nation of Islam traces back at least to his days as a law student in 1989 and 1990. The PowerLineBlog.com reported in 2006 that Ellison had used the names Keith X Ellison and Keith Ellison-Muhammad during his student days, writing columns in a student newspaper that defended Farrakhan against accusations of anti-Semitism. In another student column, Ellison called for a separate nation for blacks. 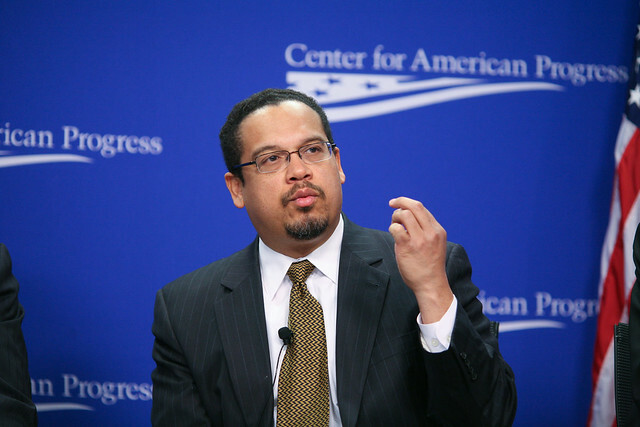 Minnesota Public Radio reported in 2006, during Ellison’s first run for Congress, that he was also a member of the Black Law Student Association and was criticized for sponsoring anti-Semitic speakers at the University of Minnesota. Ellison later promoted Farrakhan’s Million Man March, appearing on stage for the speech of Nation of Islam activist and spokesman Khalid Abdul Muhammad. In an April 2011 interview with Sean Hannity, Ellison was asked if he thought the Nation of Islam should be “investigated” by the government.